Meteorologist Evelyn Cusack highlighting the power of Hurricane Ophelia. 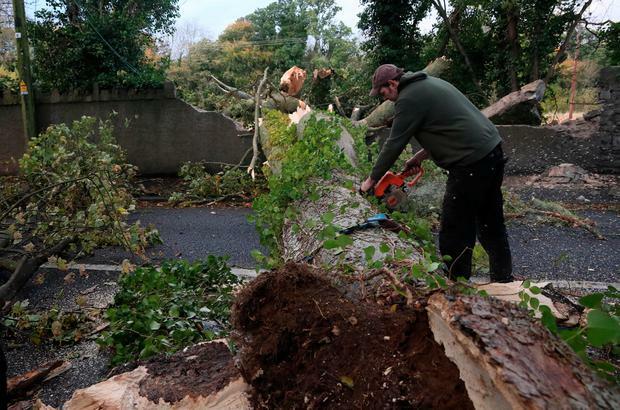 Ireland is beginning to look toward addressing the trail of destruction left by Storm Ophelia which has wreaked havoc on the country for more than 12 hours, costing three lives and causing millions of euro in damage. While the storm is continuing to affect the northwest of the country, the clean-up effort is already underway in some parts of the country and will begin in earnest later today. The Defence Forces have been deployed in Cork city, which was badly affected by the storm. On Tuesday more resources will be deployed to the parts of the country most affected. We look at the plans in place to begin addressing the damage caused and also at public services, as most resume today. Some 295,000 households and businesses are without power and up to 5pc of those could be without power for ten days. The ESB said “all customers” should prepare to be without electricity for a number of days after trees downed pylons and power lines, with 3,200 individual faults across the network. More than 2,5000 workers are working to restore the network and the government has pledged all staff and available contractors will be available from today to restore electricity. The utility expects to restore power to between 70,000 and 80,000 homes a day. "Extensive power outages” affecting treatment plants and pumping stations have been reported by Irish Water, with communities in the south left without water, particularly in areas with no water storage facilities and where burst main repairs could not be completed on safety grounds. A “limited number” of boil water notices are in place following power failures on small supplies, and some untreated sewage was being discharged after power failures in wastewater treatment plants. Work is continuing to repair these failures - with focus being placed on the largest supplies. Telecoms company Eir said at least 11,000 customers were without a broadband, telephone or mobile service following “unprecedented and widespread” levels of damage to poles, cables and mast infrastructure. The company will be working to restore service to those affected as soon as possible. Councils around the country will be assessing the damage caused by the storm today. The Government has pledged additional funding for the recovery operation. The Road Safety Authority warned that motorists need to remain vigilant today, as many roads will be flooded or blocked with downed trees, branches and pylons. Severe winds may also have loosened roof tiles which will continue to pose a risk. “Council workers and emergency services will be out clearing these routes and people need to anticipate encountering these scenarios when using the roads,” it said. All services are expected to resume on Tuesday with the exception of school bus services. "Bus Éireann plan to operate a full schedule of services tomorrow (October 17) from 0500 hours, with the exception of services provided under the School Transport Scheme. "This is due to the decision of the Department of Education and Skills that all schools should remain closed tomorrow. "This resumption includes all Bus Éireann services, the Expressway network, Eurolines and GoBÉ services. "However, we expect disruption to some services in areas where the worst damage has been caused by the storm. "This may include diversions, delays or cancellations. We will be guided by the advice of local authorities or other bodies regarding roads that are affected. "We will be providing updates on www.buseireann.ie and on Twitter and Facebook @buseireann and to local, regional and national media – as soon as the position becomes clearer. 05.50 Cork to Dublin Heuston cancelled, 06.15 Cork to Dublin Heuston will additionally serve Mallow, Charleville and Limerick Junction. Limerick to Ballybrophy via Nenagh services cancelled. Bus substitution in place. 09.45 Westport to Dublin Heuston cancelled. All other services are expected to operate, subject to line inspections. The Luas Red and Green Line services will not be running until at least midday due to damaged caused by the storm. In a statement Luas operators confirmed that services would still be affected tomorrow morning. The statement reads: "There will be no Red or Green Line services on Tuesday morning October 17th 2017. "Earlier today an incident occurred in the Luas Depot, Red Cow, Clondalkin. "A technical room was damaged because of Hurricane Ophelia. "It will take time to investigate the damage caused and time to repair. We are not able to give an estimate in relation to the time it will take. "Luas will inform customers, media and the public about Luas services post a 12 noon meeting tomorrow. "Luas has updated the NECC on this matter. "Luas customer care is open 7am – 7pm." Services are due to resume this morning. University of Limerick and GMIT are among those due to re-open. The Mountbellew campus of GMIT will remain closed however. Maynooth University will not be re-opening. But childcare facilities that decide to remain closed on Tuesday as a result of the storm will still be entitled to claim State funding for the day. Crèche owners have been urged to take no chances as "safety must be the top consideration".